Being a hoarder obsessive (not even joking), I also find it virtually impossible to pass up a $20 sewing machine even though my “office” is full of almost too many of said machines to move in. One day, I will start an Etsy shop. But not today. So Goodwill has provided me with multiple Husqvarnas in various states ranging from completely frozen to partially frozen to filthy and seemingly hopeless. In addition to the 19 with the belt problem, I have a 1030 (frozen handwheel/main shaft) and a 6020 with a frozen stitch selector and a broken stitch selector knob from someone trying to force it. I also bought another mystery one from ebay which looked to be in good condition, save for the missing speed control/power cord. 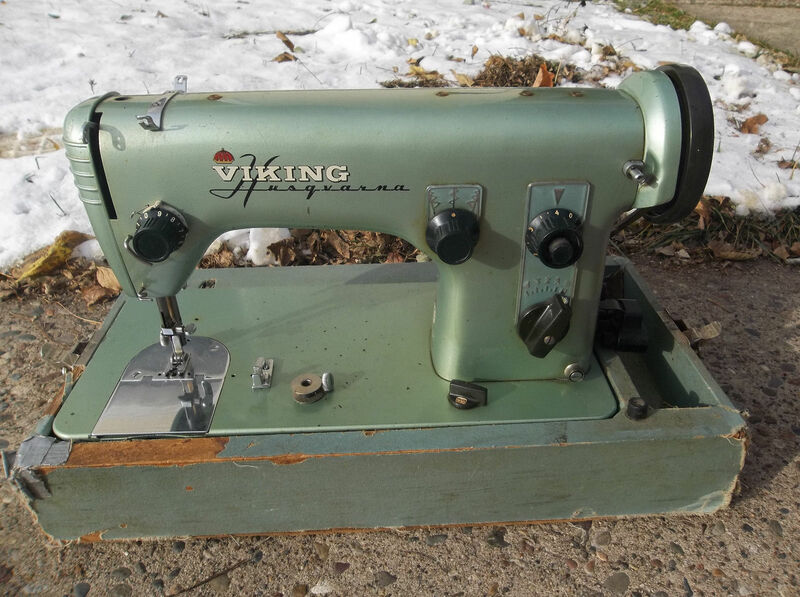 What some internet scouring and the super-helpful Yahoo vintage Husqvarna group tells me is that it’s a Husqvarna Viking 51E. Which is basically just a flatbed version of the Husqvarna 21 (which some argue was the best vintage Husqvarna model). It’s nearly impossible to find anyone talking about the model online, so it will be interesting to try! It has a three prong power cord, which doesn’t look like anything I currently have except maybe the Slantomatic cord, which is the wrong shape. I’ll have to see it in person before I try to find a replacement. Regardless, I love the green finish and the styling. My guess is that it, too, will need a new belt, but looking at the external setup and the lack of a reduction gear involved, my guess is that it will be easy peasy to throw a standard stretch v-belt on there. Also, with the way that everything is aligned and that exposed handwheel, if I could rig that up in a treadle table I bet I could even treadle with it! Next Post Why Sewing Machine Addiction? Hi–I’m actually not very impressed with any Husqvarna I’ve sewn on, I’m afraid. The old green metal bodied ones look gorgeous, and the ones with the metal cleated belts seem like they would have a lot of power but in my limited experience, they weren’t any better for actually working on than any of my other Singers. The bobbin design is unusual and unless using a plastic bobbin, with mine, it was loud and finicky. The real reason I dislike them, though, is for maintenance reasons. Replacing a belt on the 19 and 21 models is a nightmare. There’s no easy way of getting in there to access stuff. And so many important pieces are little and plastic and brittle after all these years. If anything breaks, it’s a big problem. In the 51, it is nice, since the belt is external and accessible, but the clutch/handwheel release knob is plastic inside and won’t hold up to much abuse. (In the slightly later models, the original bearings were saturated with lubricant and they often bind up and freeze completely. When you try to spray them with something like WD40, it essentially ruins the machine. I’d be careful of that buying them secondhand, too. But I’m rambling.) Anyway, I wouldn’t consider any domestic husqvarna to be a semi-industrial. They aren’t built tough like the Bernina “semi-industrials” and with so many crucial parts being brittle plastic, using it for anything heavy duty will probably just end up breaking something important. It’s so cool that you have your grandma’s machine–and also that they found you a belt! There is a series of parts that has to move the needle bar from side to side for zig zagging, and in my limited experience when these aren’t used they tend to gunk up with old oil and need to be unstuck. I wouldn’t sink a lot of money in it either, but often fixing gunk related stuff only requires the right kind of lubricant, time and some heat. If you can, try to get some TriFlow (Amazon carries it) in oil form–the spray kind will get everywhere inside the machine, I find) bc it really does work wonders that regular sewing machine oil can’t and you can use it for regular oiling too. Blue Creeper is harder to find but works even better at penetrating gunk in old machines–I apply it to all the oiling points, let it sit overnight, and then the next day parts are often unstuck. And the super secret weapon is a blow dryer–if you work your way over the moving parts using it to really warm the metal it expands and contracts with the temperature changes and this helps the lubricant work in and makes the old gunk temporarily pliable. So if you lubricate it, heat it, and gently try the zig zag motion it might unstick. The problem I’ve had with some Husqvarnas, though, has also been the knobs being brittle crap plastic that breaks or strips and then won’t work right with the inner mechanisms. So hopefully it’s just gunk. Good luck! 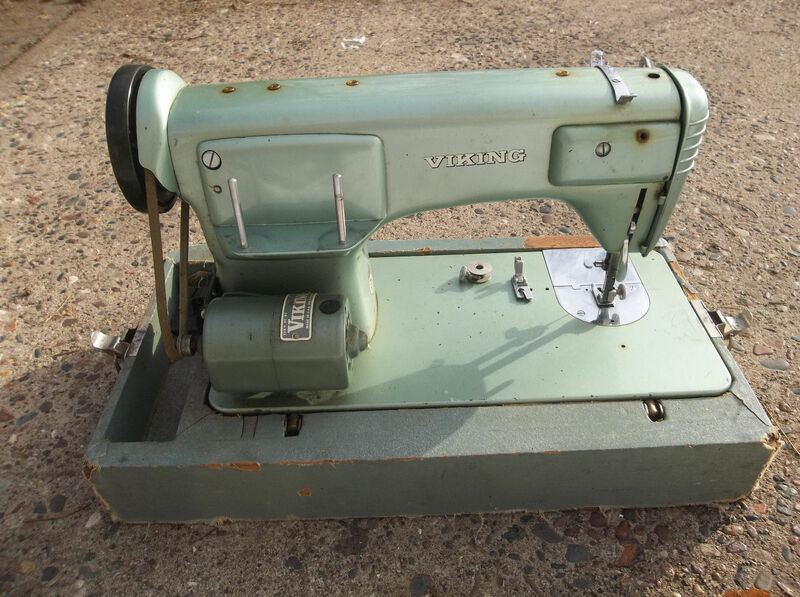 Do you happen to have the manual of this sewing machine? I really need it!